Our next Soundcast comes to you courtesy of Derek Williams, aka Boots Boogie. Boots has been spinning for 16 years at home base in Toronto, ON and his selection quest has brought him journey to Montreal, New York City, and more. He has been involved with throwing countless parties in the Toronto area. His threw down a set during Buffalo Pride Week 2015 – with his trademark quick cuts and effortless hops between house, disco, funk, hip-hop, and anything else objectively funky. “This mix is an ode to the underground, warehouse and late night sounds of the ‘90s that has influenced me as a DJ for the last 16 years and continues to influence house music in 2017,” he says. Perhaps his greatest skill is keeping the energy high and the vibes flowing while he blends together genres. Though this mix is house focused, Boots explains, “I always love to include throwbacks and DJ tools; anything from classic, booty, Chicago and Detroit house garnished with some acapellas.” And it’s true – he slips in gems from some of house’s most revered labels and artists of the ‘90s and beyond. When asked to speak about the vibe of this mix, he says, “This set is a huge reflection of the sound and skill I’ve been rinsing out on late night dance floors in Toronto as Boots Boogie and as Das Nasty.” Das Nasty is his newest project alongside partner Shanelle Williams with the name being derived from a focus of music new and old that can only be described in one word: nasty. Along with a collective of other Toronto DJs, Das Nasty has been throwing disco house shindigs and afterhours events that according to Boots “play host to a positive, old-school vibe.” In fact, Das Nasty was hosted by good friends of Sequencer, Rochester’s Sole Rehab, for an event last year. One concept they’ve been pushing is “DAS TASTY” – a pairing of excellent dance music and an exciting local food specialty. Additionally he has been serving “beats and brunch worldwide” through his established Hip-Hop & Breakfast. Keep an eye out for more Northeast performances from either Boots Boogie solo or as Das Nasty in the near. What’s next for him? 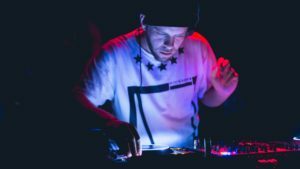 Other than continuing the parties, events, and performances, he is teaching the art form of DJing and is striving to eventually open his own DJ school.